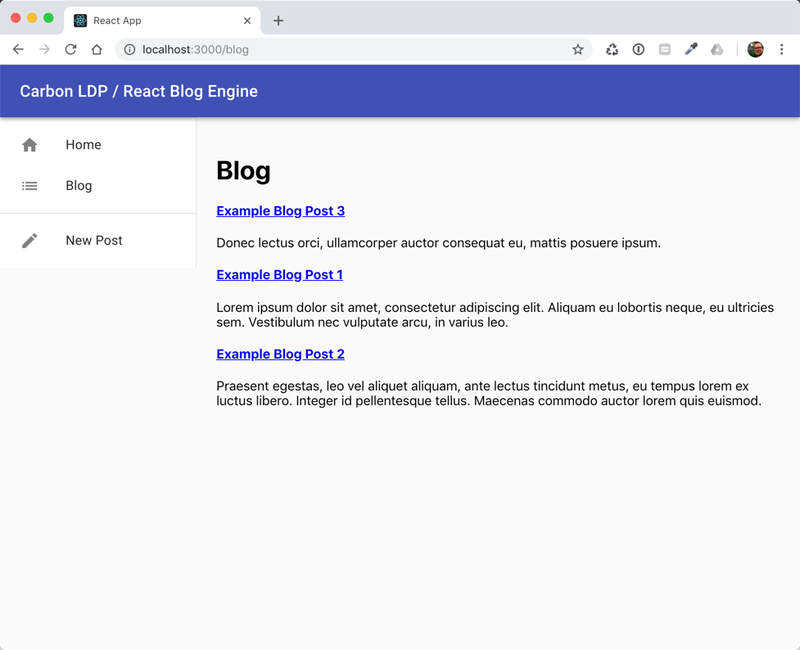 In this tutorial series, we’ve been demonstrating how you can build a blog engine with Carbon LDP and React. Carbon serves our data layer and React is the library we’re using for the user interface. 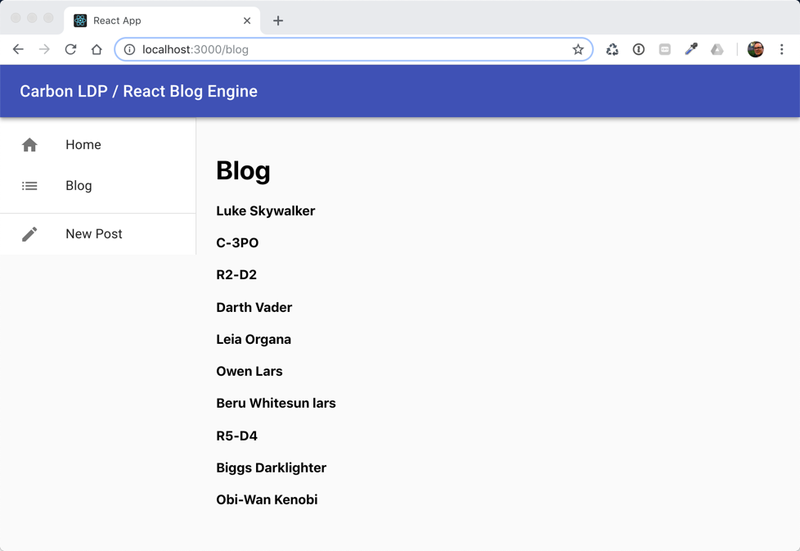 In part 1, we set up the front-end with React and we created a simple blog post input form. In part 2, we updated the form so that when it’s submitted, blog post data is saved in Carbon. Today, in part 3, we’ll implement the blog post list and detail view so that users can browse and read the posts from the Carbon server. Let’s get started. Note: Complimentary source code for this tutorial can be found in the GitHub repo, carbonldp-react-blog. For the list of recent blog posts, we already have a view component that you can navigate to by clicking Blog in the app’s menu. Let’s first rough out what we want that view to look like with some Material-UI components and some mock data. We’ll swing back around later to replace the mock data with real data retrieved from Carbon. This will render a list of characters from Star Wars. Warning: Each child in an array or iterator should have a unique "key" prop. Now, with the key in place, the console error goes away. Having a unique key for dynamic JSX elements is a requirement in React. Now, we’ll use a technique for Reading documents, which is covered in the Carbon LDP product documentation. It is fairly common for applications to require only certain properties of a document. This can happen, for example, when rendering a list of objects and just displaying their name. In our case, we only need to render certain properties of the blog posts in our list, so we’ll use this approach. Here’s how. Now, when we run the app using npm start, we are able to click on the Blog menu item and see the list of posts that have been retrieved from Carbon. In keeping with our practice of committing at stable checkpoints, I will commit here with the following message, so that you can find this checkpoint in the Git history. 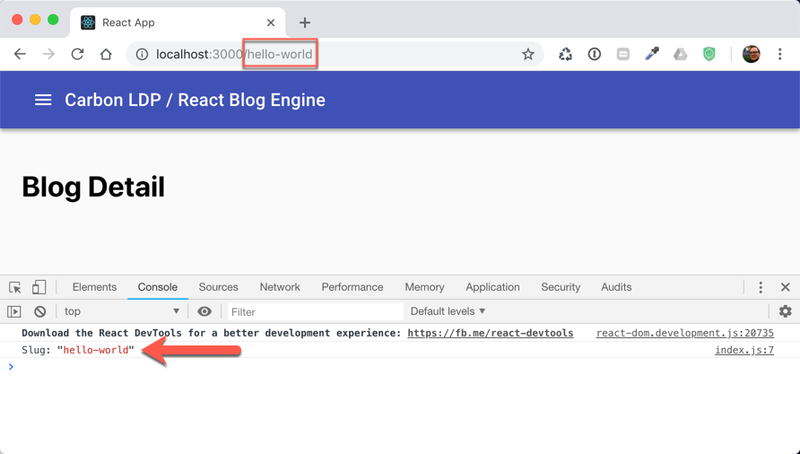 Next, we need a component for rendering the actual blog post when we click on a single blog post from the list. We’ll call this the BlogDetail component. As you can see, we’ve got a handle on the parameter that’s passed through the parametrized route, which we’ll soon use to find the appropriate document to load from Carbon. Here, we’re simply using the slug from the route to call for the document in Carbon under posts/, which we know we named by slug. Notice that we appended a trailing forward-slash, however. This is something that people often forget when trying to resolve documents in Carbon. The forward-slash is part of the document’s id and therefore necessary to locate it. Unlike on some web servers, Carbon does not treat the lack or addition of a forward-slash as the same. 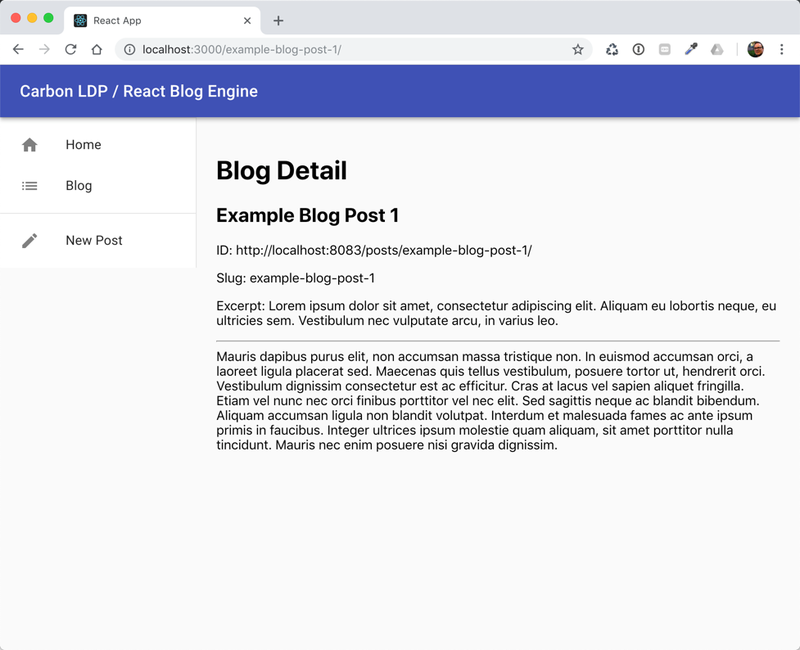 Here, we’re using the React Link component to create a hyperlink with the slug of the particular blog post being iterated over in the view. I’ll commit at this stable checkpoint with the following Git commit message so that you can find it in the commit history. Linked blog list items to the BlogDetail view.